It’s funny how something that starts as a fun project can grow into a full time job… I remember when I first started using Instagram. I didn’t know how hashtags worked, I used the Hefe filter on full blast, and my feed was a complete mishmash of photos, but the thing I loved about it, was being able to discover amazing new brands that I would never have heard of otherwise. Instagram is quite a different prospect to me these days… It’s a place to share my ideas, a diary of sorts, but also a portfolio of images for followers and brands alike. I still love it, but I’ll admit that at times it’s my ball and chain. A source of undue stress and angst (how do we let the little things take over…?) but the thing that still keeps me scrolling down for more are those moments of brilliance when you find a gorgeous image, a dress that you can’t get out of your head, or in this case a pair of earrings… and there’s a always a story behind it. An exchange of likes and comments, that if you’re lucky enough leads to a meeting to hear that story from the brains behind it all. A couple of weeks ago I spotted a gorgeous pair of earrings on a fellow blogger and I tapped the image to see they were by Sammie Jo Coxon – a designer I hadn’t yet heard of, but nevertheless I wanted to tell the designer how much I loved them, so I left a little comment on her profile. This led to DMs on Instagram with Sammie, a chain of emails and the delivery of some stunning pieces of jewellery to try out. I took the pieces to Paris with me to feature in the Nuxe digital campaign I was shooting and agreed to meet her back in London a week later so I could return the pieces. The night before we met I was getting ready for dinner with friends at our new apartment when the clouds broke after a seriously gloomy day. I wanted to make sure I had a couple of extra images of the jewellery so we stepped out on to the balcony to take a quick set of snaps before running out the door to dinner, and they’re some of my favourites. That hazy, warm reflective glow of sunset gets me every time. The next day I (somewhat begrudgingly!) returned the jewels and had a lovely morning chatting with Sammie, about everything, from her stories of learning the ropes in the jewellery trade, to her wedding plans (and hints to her now fiancé about what ring she would want!). Sammie is a true talent. 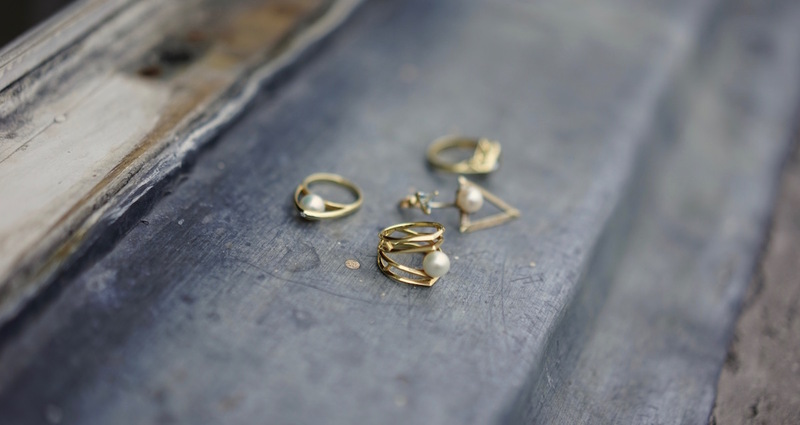 She uses traditional metals and stones (think diamonds, pearls and aquamarines) to create modern geometric designs that look both graphic and elegantly timeless. Her collections, as well as bespoke pieces, are designed in London and are all handmade by specialist craftsmen in London’s original jewellery hub, Hatton Garden, which is a really special and unusual quality these days. Please be sure to check out her collections here. I also think it’s important to note that whilst I did borrow some pieces from Sammie, this post was not sponsored or requested. Like the good old days, I just found a designer, loved her collection, and wanted to share it with you. Have you found any gorgeous new brands recently? Do tell! I’d love to see and hear what you’re loving at the moment!